Amber Coast Casino is owned and operated by Nameguard Holding Inc a European incorporation, a daughter company of Amber One and is a legally operated online casino, fully licensed and regulated under state laws by the government of Curacao. Amber Coast Casino is a new Playtech casino which offers you all the specials and great features that Playtech casinos have to offer. This includes Playtech Virtual gaming platform and state-of-the-art encryption and firewall technology for the website and transactions to be cheat proof. They offer the fairest, most secure and safest Online Casino gambling system available. 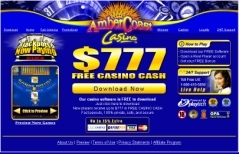 Amber Coast Casino gives the Online Players Association (OPA) continuous access to Random Number Generator, which it verifies as being true and fair. The OPA also publishes an official monthly report to verify the casino's payout percentages. Players can review every wager ever placed at Amber Coast Casino at any time. Unique built-in game and financial history feature includes the exact date and time, amount wagered, winnings, and detailed game results. The financial transaction history displays all of the deposits and withdrawals from the player's casino account. These features can be accessed at any time while you are online. One of the popular games at Playtech casinos, is the Blackjack switch. So often when playing multi-hand Blackjack, you see a picture card in one hand and the ace in the other - well with this game, you can switch one of the cards to the other hand to make sure of your blackjack at the one hand. Speaking of progressive, you will find 11 fantastic Progressive Jackpot games with high potential payouts. These compliment the other games that include many Poker games like Pai Gow and Blackjack games such as traditional and the Switch variation. Slots, Video Slots, Sic Bo, Roulette and Craps round out the games selection. Customer Service is available by toll free phone 24/7 to assist you. Amber Coast is committed to fair gaming and is a member of the Online Player's Association, so you know you are spending your money at a safe, honest and secure casino. $777 Welcome Bonus For New Players!- On first deposit, you earn a 100% bonus in Blue Chips up to $200. On second purchase, they give additional 25% up to $200. In third deposit they give 50% bonus, again up to $200. The fourth and final purchase of the promo gives another 50% bonus in Blue Chips up to $177. $200 + $200 + $200 + $177 = $777! Add it all up and it comes out to the possibility of you earning up to $777 FREE! Neteller Bonus - Use NETELLER transfer service to deposit funds to your Amber Coast Casino account and get 15% MORE MONEY on every deposit. Birthday Bonus - Amber Coast Casino offers players a special $25 Birthday Bonus. Complimentary Points : Every $10 you bet in any game = 1 Comp Point 500 Points = $1 is added to your account. Loyalty Bonus : You will constantly find new bonuses and events when you play here which you can use to try new games and go for the big Jackpots!